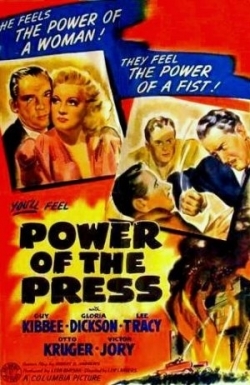 Line from the film: "Freedom of the press means freedom to tell the truth"
1943’s Power of the Press was based on an original story by Samuel Fuller (director of such hard-hitting films as Shock Corridor, Pickup on South Street and The Big Red One), who, at the age of 17, worked as a crime reporter for the New York Evening Graphic. It was a profession he clearly loved, and even though the dialogue in Power of the Press is often heavy-handed, the film’s tale of an unscrupulous city newspaper is strong enough to keep our attention throughout. As Power of the Press opens, Edwina “Eddie” Stephens (Gloria Dickson) is reading a scathing editorial, printed in a small-town newspaper, which takes aim at her boss, John Cleveland Carter (Minor Watson), publisher of the largest daily paper in New York City. In this article, the writer, Ulysses Bradford (Guy Kibbee), attacks Carter’s integrity, accusing him of “creating” the news instead of reporting it. Stirred by these words, Carter decides to change how his newspaper, The Gazette, does business, a move that angers his partner, Howard Rankin (Otto Kruger), who’s been fabricating news stories in order to stir up anti-war sentiment. When Carter threatens to expose Rankin’s unethical practices along with his own, he’s shot by one of Rankin’s cronies. But before he dies, Carter changes his will, leaving his controlling interest in the newspaper to none other than Ulysses Bradford! Spurred on by Eddie, Bradford takes his place as the new publisher of The Gazette and insists that the paper start presenting both sides of every story, something that doesn’t sit well with either Rankin or Griff Thompson (Lee Tracy), the head of the newsroom. Things take a turn for the worse when Rankin frames former Gazette employee Jerry Purvis (Larry Parks) for Carter’s murder. Can Bradford and Eddie prove Purvis is innocent, or will the poor guy be sent to the electric chair for a crime he didn’t commit? A love letter to the “Fourth Estate”, Power of the Press spends a great deal of time pontificating on the importance of a free press while attacking those who use the media to further their own agenda. “Beware of those who hide behind the front pages of America”, John Cleveland Carter says during a speech he was giving right before he was shot, “who use, for their own advantage, the power of the press. They are as dangerous as enemy planes, guns, bombs, tanks!” And because it was produced during World War II, Power of the Press also features some flag-waving propaganda (Rankin is called a “traitor” for suggesting America should stay out of the war, and the strong-arm tactics he uses to control the newspaper causes Eddie to compare him and his cronies to the Gestapo). Yet, despite its tendency to preach, the movie manages to draw you into its story of journalistic integrity, and the scenes that show us the inner workings of a city paper are intriguing, to say the least (Guy Kibbee delivers a fine performance as Ulysses Bradford, giving the character a down-home innocence that works to his advantage in almost every situation, but it’s Lee Tracy’s Griff Thompson who steals the show. He may have turned a blind eye to Rankin’s corruption, but Griff is a bona-fide newspaper man who knows how to tackle a big story, and over time we come to admire his tenacity). Fuller would eventually direct his own newspaper-themed film, 1952’s Park Row, and while that movie is superior to this one in almost every way, Power of the Press does manage to get its point across rather effectively.